Pure Pleasure Bath Oil – Made with pure essential oils of Orange, Rosewood, Geranium, Ylang Ylang and Sandalwood Australian. Carefully blended in gorgeous Sweet Almond Oil with a touch of emulsifier to help the blend disperse in the bath. The combination of a hot bath, the enticing, sweet aroma and the soothing oils will get you super relaxed. 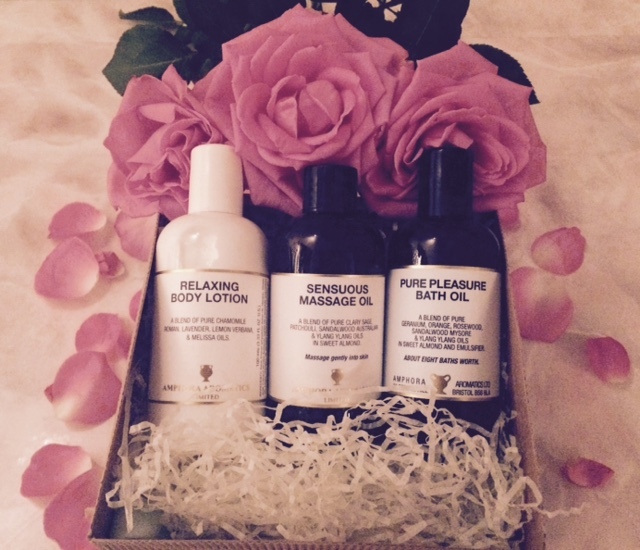 Sensuous Massage Oil – So you’ve had a lovely bath wouldn’t it be nice to get a wonderful massage now? That’s why we’ve included our delightful Sensuous Massage Oil. Made with romantic and aphrodisiac oils like Clary Sage, Ylang Ylang and Patchouli carefully blended in nourishing Sweet Almond Oil. Relaxing Body Lotion – Another heavenly blend of oils in a lovely, gentle lotion that will help you to completely unwind. Made with pure essential oils of Lavender, Chamomile Roman, Melissa and Lemon Verbena. *The UnNatural Mother can not be held responsible for any unplanned babies conceived during the use of Amphora Aromatics Love It gift set. I did get a nice card and flowers as well. when we was young he got me a packet of lovehearts sweets lol really? An electric tyre pump – he thought it would be useful bless him! A pink toilet seat and an iron off my ex years back. He never was good at choosing gifts lol. The worst valentines gift I ever received was a fruit hamper with hardly any strawberries! I’m not sure if it was a hint that I needed to loose weight or not but I wasn’t best pleased LOL!!! Reduced price flowers from Asda. I wouldn’t have known but he left the label on. I’ve never received a bad gift so the worst gift would have to be nothing! The worst Valentines gift I’ve ever received…hmm…it technically wasn’t his fault but when I was 16 my first ‘serious’ boyfriend booked a Valentines 3 course set meal at a local restaurant…and weirdly, the starter was a tin of Heinz vegetable soup! I said nothing bit it was so obvious. Not a bad gift really but it still makes me laugh. Didn’t get anything this year, not even a card! A Smiths record from my first boyfriend at 15. he was too embarrassed to buy the Wham album I wanted so bought his favourite groups album instead. A parker coat age 16 I was 28! A box of heart-shaped chocolates that were a week out of life. Yuck. I have never received a bad valentines gift as the hubby usually just gets me flowers. I was so excited as it was quite a big box all wrapped up,can you imagine the disappointment when after excitedly ripping off the paper discovered….an electric paper shredder !.He was so pleased with himself as he remembered I’d mentioned it in the passing,gutted doesn’t even cut it ! probably my new hoover, although it is a hetty and it is pink!! A half empty bottle of perfume..His ex had left it there..I wasn’t thrilled! A Wonder Duster with instructions of how and where to use it!!!!!!!! We’ve never celebrated Valentines day as our anniversary of the day we met is so close so we celebrate that instead.